Miles' winning cartoon, from March 2013, was titled 'Swing Shift', earning him the first major award of his career and will hopefully bring him the recognition he deserves, and which so often eludes cartoonists based outside of the country's biggest cities. 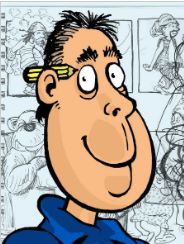 Miles has been referred to as 'South Africa's Giles' in recognition of the British cartoonist's influence on his work. Miles has previously won provincial awards, and been a finalist in the awards when they were called the Mondi Shanduka newspaper awards (2009), and he has also been a regional winner in the Vodacom Journalist of the Year (2011) and the Standard Bank Sikuvile (2012) awards, but this is his first national win. “It’s good to receive the recognition and the affirmation from other journalists, especially working out of the mainstream area. It is also motivating,” Miles said after the win. 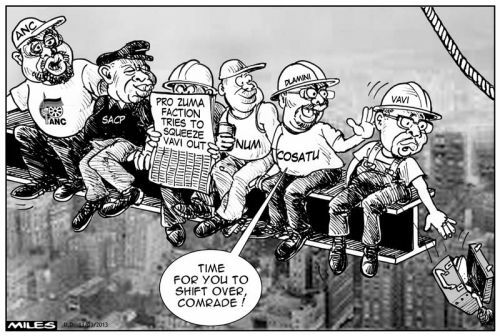 Former Mondi Shanduka Newspaper Award winning cartoonist Wilson Mgobhozi submitted a selection of three cartoons which earned him the place as runner up finalist, while former Vodacom Cartoonist of the Year Jerm received a judges' commendation for his cartoon, 'The Creation of Mandela'. Focus on Values in 2014 Jounalism Awards - Anton Harbour, Business Day.